We all know that November is a time in America where we take a look around us and realize what we should be thankful for in our busy and hectic lives. We sit down with our family members and loved ones for an amazing feast and realize that we should appreciate the things we take for granted on a daily basis. What we don’t, however, realize, is the marketing opportunities that come along with a holiday such as this. Thanksgiving is not just a time to be thankful, but it is also a time to begin shopping for the holiday season that is right around the corner. With age old traditions such as Black Friday and the more modern concept of Cyber Monday, there are so many creative ways marketers can get their message across to multiple audiences. 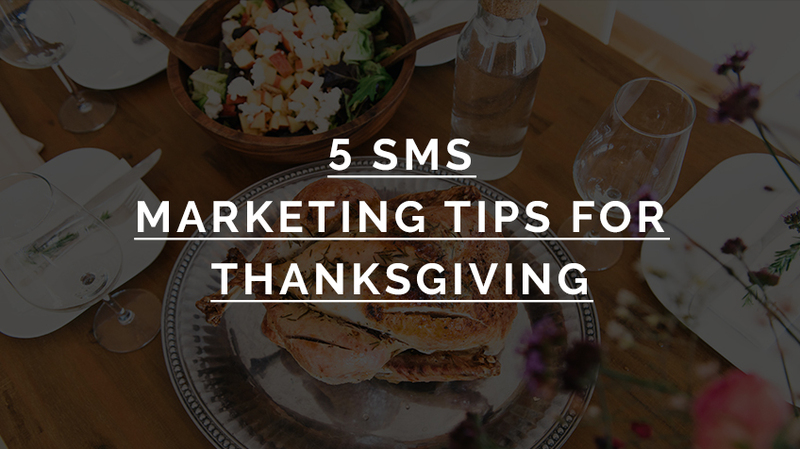 Here are five SMS marketing tips for Thanksgiving that any mobile marketer can use in order to yield more successful results in the long run. 1. Send Out A Thank You Message. Sending out a simplistic and generalized thank you message to your clients during this time of year won’t go by unnoticed. This tactic will show your customers that you care about them as individuals rather than just look at them as dollar signs. Best part is, not much effort is needed to send out a thank you SMS. 2. Set Up A Promotion. If you would like to take your thank you message one step further, give your clients a bonus by initiating a promotion in their honor. Thank them for being loyal customers by giving them a great deal. This will show them that you have their best interest at heart and will drive business up at the same time. 3. Get Festive With Visuals. November is definitely a time to take advantage of certain icons and images such as fall leaves, pumpkins, and gourds. Everywhere you go you will feel the Thanksgiving festivities. Whether it be in display windows while shopping or even on company websites, you will find Thanksgiving images all over the place. So why not use this technique in your SMS marketing? Create graphics using these themes and send them out to your clients using MMS. A picture is worth a thousand words, so take advantage and send one out to spread the Thanksgiving cheer! 4. Give Back To Your Customers And The Community. A great way to interact with your customers in an effective way during Thanksgiving is to run a campaign in which charity is involved. Send out an SMS to your customers saying that with every purchase from whatever day you decide until Thanksgiving day you will donate $1 to a local charity of your choosing. Not only will this give your business great publicity, but it will also help boost sales during the holiday season. 5. Be Unique With Whatever You Do. Thanksgiving is a time when you can use your creativity to your advantage in the world of SMS marketing, so really go for it! Everyone around you will be taking advantage of the marketing opportunities that come along with Thanksgiving, Black Friday, and Cyber Monday so try to stand out of the crowd. Try and stay away from being generic and add your own personal touches into the mix. In the end, it will make a really positive difference to your SMS marketing campaigns!